It’s been a while since we’ve seen a group comprised of all females in the experimental rock scene. There’s been a notable lack of solid girl groups these days, but we’re happy to report that the drought is over thanks to a great show tonight at Neumos. With ethereal vocals, haunting harmonies and some serious art-rock chops, LA’s Warpaint is redefining what it means to be a girl group. While they’ve been around since 2004, last year’s release, The Fool, proved to be a breakthrough for the band and the critics’ accolades have been rolling in. The group evokes past female rock powerhouses, like The Breeders, and performs with the perfect balance of sultry and skill. Like modern day siren songs, their music is interesting to the ear and almost addictive for the mind. This is definitely a must-see show this weekend. 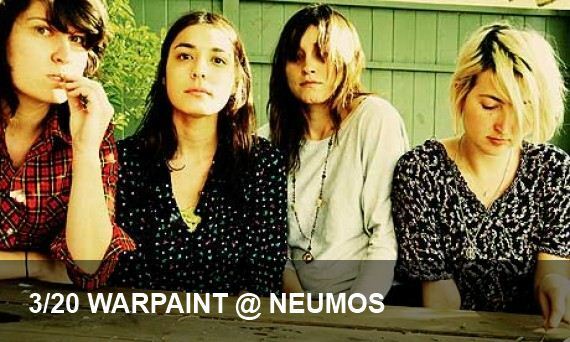 Warpaint will be joined by PVT and Family Band at Neumos.